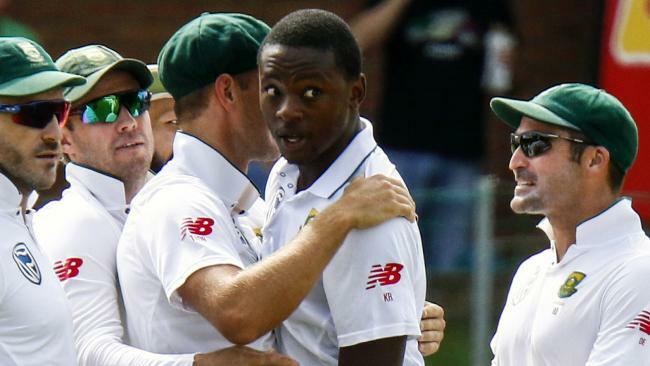 South African bowler Kagiso Rabada is still waiting to hear whether he’ll be cleared to play in the third test. 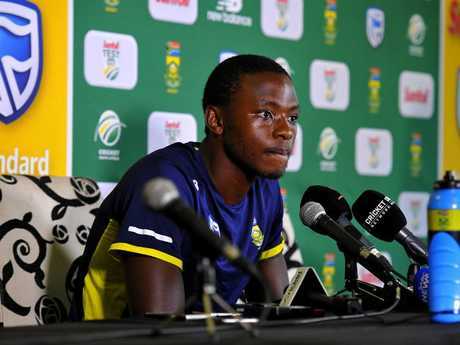 KAGISO Rabada will soon learn whether he will play in the third Test following a marathon six-hour appeal hearing on Monday night in Cape Town. The ICC's Judicial Commissioner, Michael Heron QC, didn't wrap up proceedings on video link until 12am (AEST) Monday in an epic session that meant Rabada was late to training with teammates on Monday. Rabada, South African captain Faf du Plessis, respected advocate Dali Mpofu and team management entered a room around 9am local time (5pm AEST) in South Africa and didn't emerge until the mid afternoon. 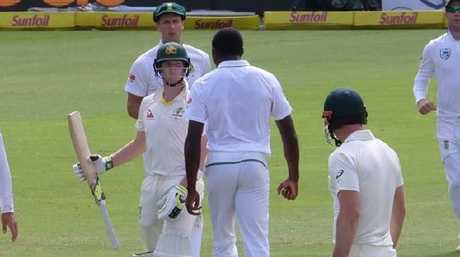 Match referee Jeff Crowe, who charged Rabada with making avoidable and inappropriate contact with Australian captain Steve Smith during the second Test in Port Elizabeth, phoned in via video link, as did the umpires from that match. Kagiso Rabada and Steve Smith during the second Test. Heron has 48 hours to hand down his decision which will determine whether Rabada's series-ending suspension stands or if he will be cleared to make a stunning appearance in the pivotal third Test starting on Thursday. 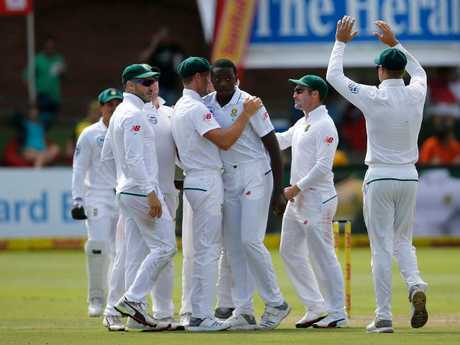 South Africa team manager Mohammed Moosajee said the Proteas were satisfied with the hearing and now await a verdict. "It's been a marathon session. But now it sits with the ICC and we have to wait for the outcome," he said. "I think in any hearing you've got to be as happy as you can be, we've put our side of the story across and now it's up to the Judicial Commissioner to make a stand on what he thinks. "The merits of the case we can't really talk about because it sits with the Judicial Commissioner at the moment. So until the ruling is made it would be impractical for us to say anything." The South Africans celebrate after Kagiso Rabada took the wicket of Steve Smith on day one of the second Test. Rabada will train again Tuesday unless he hears definitively that he's been ruled out of the Test. "Most definitely, most definitely. That's one thing for sure," Moosajee said. "We've said it from the beginning. He needs to make sure he plans as if he's going to play." South Africa trained at Newlands without Rabada for a large portion of the session and claim it's been business as usual. "We haven't even spoke about it since we got together today," opener Dean Elgar said. "We as players are trying to isolate ourselves away from that situation. We know as players we don't have an influence with regards to what's happened in the hearing or what can possibly happen. "But it would be nice to put it behind us now. 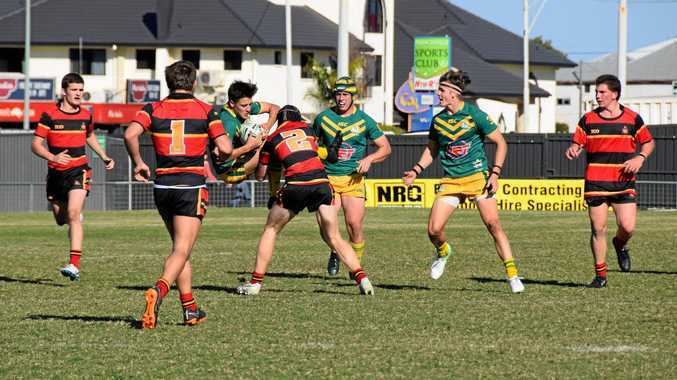 There has been so much noise and people have actually forgotten there's such a great Test series happening between two extremely strong and competitive teams. "It's such a pity that all this backroom noise is actually hindering what is a quite exciting Test series. Kagiso Rabada would be a huge loss to the South African team. "Whatever happens we just put it behind us and whether KG is playing in the third Test or not it's out of our hands and hopefully we can put this behind us an carry on playing cricket." Elgar said it would be a huge turning point in the series if Rabada beat his suspension. "Having him in the side is massive for us. I think it's massive for the game, it's massive for the format, because KG is an extremely special cricketer," Elgar said. "But we do know there are rules that are implemented for certain incidents in the game and we as cricketers respect that. If he's good to go for the third Test it would be awesome for us and awesome for the game."